Cary Fukunaga’s Beasts of No Nation (2015) is a harrowing, surreal, and often times bleak portrayal of a reality many of us shy away from. There is no denying Fukunaga’s talent as both a screenwriter and director. Hot off his success of True Detective, Fukunaga moved on to adapt Uzodinma Iweala’s novel of child soldiers in an unnamed African country. I was gripped by the approach to the material here, there is no denying that Fukunaga knows how to craft a story and capture it with beautiful imagery. But because it’s so unrelenting, so vivid in giving us the brutality of this world, I have trouble in saying that I found enjoyment or fulfillment in watching it. I came away with a profound sense of sadness. If that’s the effect Fukunaga was aiming for, he achieved it with flying colors. 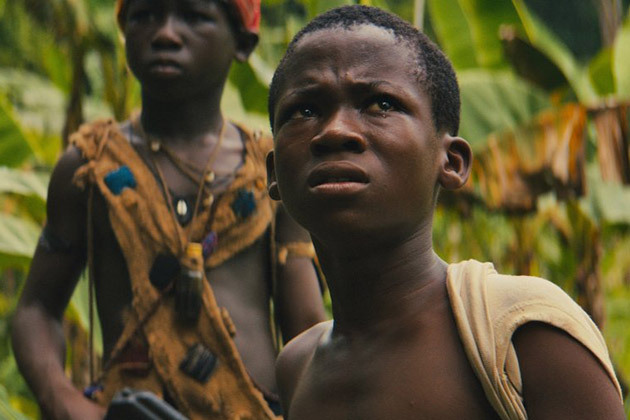 What a strong debut for young actor Abraham Attah. He plays the central role of Agu, a boy who – under the violence and unrest of civil war – loses his family and is quickly forced to become a member of guerilla rebels. Attah plays Agu with a wide range of emotion. In the beginning he’s seen as a regular young person, playing with friends without a care in the world. Opening scenes have them trying to sell a broken television set to locals, using their imaginations to act out programs they would want to see. But things change when Agu comes face to face with the horrors of warfare, and the cost of becoming a part of it. Attah is often shown merely observing everything happening around him. The tragedy is in wondering what could possibly be going on in his mind. No one should be put into that situation, especially someone his age. The ramifications are too troubling to think about. But Agu is forced to join, and is trained by other young soldiers to fight and kill. Fukunaga inserts a strange dynamic among these characters. Through repetition and training, they are molded from innocents to killers, willingly able to execute anyone deemed an enemy. It’s like brainwashing through peer pressure. One of the most unsettling scenes puts Agu in a position to kill a grown man, who is begging for his life. Fukunaga draws the tension to almost excessive levels, never pulling the camera away to shield us from the terror. He then counters moments like this by showing the relationships between the soldiers in familial fashion. Through their experiences, the boys create a kinship with each other. They are a like family even through their bond is made out of bloodshed. One moment they’re ambushing a military convoy, the next they’re playing soccer, or dancing and singing in rhythm. It’s these two contrasting sides that make the whole piece so dreamlike. We’re reminded that even though these characters are trained to be killing machines, they’re still young people in search of guidance. Agu makes a connection with Strika (Emmanuel Nii Adom Quaye) a boy similar in age. Strika says nothing through the story, but acts as a brother to Agu, looking out for him when things get brutal. It’s fascinating, to see the compassion between two characters amidst such darkness swirling around (and through) them. Every “family” needs a head of the household, and in this case it is the Commandant, played with eerie charisma by Idris Elba. The Commandant is a swaggering, imposing figure, both in his physical size and in his persona. Elba fills the role with such confidence that we can see how he can sway young minds into following his every order simply by playing to their needs. But like every ruthless leader, the Commandant is full of contradictions. We don’t learn much of his background, and while Elba is the biggest name here he is relegated to a supporting role. But we’re given enough to see that cracks showing beneath the tough exterior. Elba does a good job at making all of the elements fit into the same person; we can see how the Commandant is both an attractive and repellent creature. Fukunaga continues his rise as an adept technician. The cinematography (also by Fukunaga) places us right into the middle of the conflict. Many times shots are placed at eye level, where we’re seeing events unfold just as the characters would. And like a character, we are made to see the violence head on. The standout moment happens when Agu and other soldiers raid a building. Fukunaga elects to shoot the scene in one continues take, as we glide through each of the rooms to witness the boys complete their mission. During this, a character stops in midstream, mistaking a random woman as their mother. It’s a moment straight out of a nightmare, calling to mind similar instances that occur in Francis Ford Coppola’s Apocalypse Now (1979). 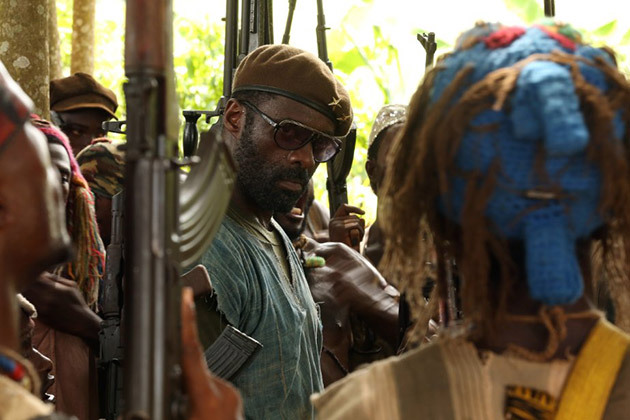 With the believability of the performances and effectiveness of Cary Fukunaga’s execution, I still wonder why I ended up having such an empty feeling for Beasts of No Nation. Is it because the harsh realism is portrayed so well that it left little room for hope? Is this all there is, cruelty and death and nothing more? Are we only to witness it and feel disheartened? I admit there is nothing about this film that can take away how well it was made, but there’s something that keeps me from fully embracing it. Something I can’t put into words…maybe that’s the biggest compliment I can give it.